Fishes look different with their adaptations for living in water. They may not scream like a human, dog or cow when they are hurt, and we may not find them “cuddly” or as relatable due to characteristics like not having eyelids (which are not needed in water). The bottom line: Fishes are animals. They are sentient. 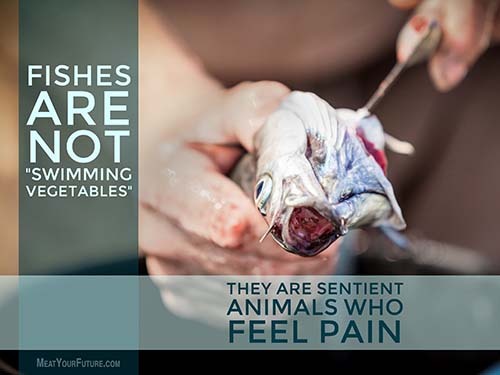 They suffer. And they almost certainly do feel pain. There are also serious health issues associated with eating fish meat, and severe environmental implications of fishing practices (not the least of which comes from a study that warns, if current fishing trends continue, we will face a complete ocean ecosystem collapse in the near-term — by 2048). Links to resources and additional information in the comments. Please consider these issues, and go vegan for your own health, for the planet, and for the animals (including the fishes).